Being a paralegal means working in a law office, handling the more mundane tasks that the attorneys generally don’t do, like transcribing interviews and conducting legal research. But that doesn’t really capture the essence of the experience. 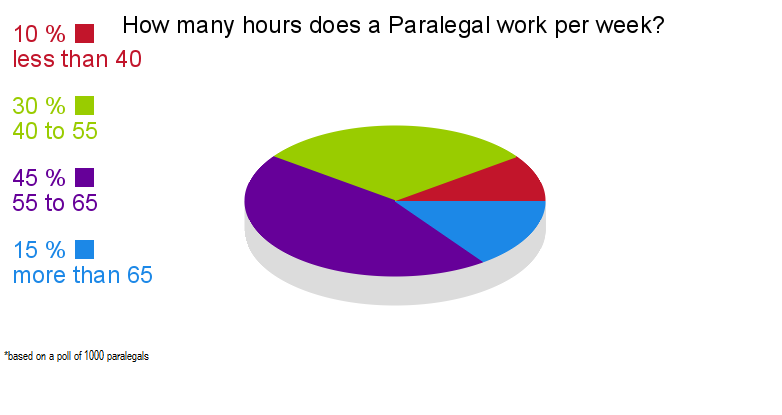 So, what’s it really like to work a day as a paralegal? It turns out that’s not so easy to answer. There are just about as many different ideas of what a paralegal does as there are paralegals! The only way to be sure what you will be doing as a paralegal is to work as one. The law firm you work for, the specialization or area of law you focus on, how long you’ve worked there, your level of education, and even your location can affect the exact kind of work you’re asked to do. Since that’s the case, paralegals need to be very open to what they’re asked to do, and they have to be adaptable on a daily basis. Too much rigidity isn’t helpful, and it’s not going to give you the opportunity to do the job to the best of your ability. Instead, be ready for change and embrace it, so you can keep growing in your career. Here are the main categories of work you might be asked to do on a typical day, to give you a good idea of what a day in the life of a paralegal is really like. No matter what you think about being a paralegal, though, one thing is clear: it’s not like any other job you’ve had before. Everything you’ve been told about being a paralegal is probably right for some people, and it’s certainly wrong for others. Expect to do a lot of different things, expect to be bored sometimes, and expect to have some really exciting moments. Sure, there are going to be boring times, or tasks that aren’t that interesting. There’s a reason that some people call paralegals “legal secretaries” or “law clerks.” In some instances, it might feel very much like you’re just a glorified secretary, and that you aren’t really getting to exercise everything you’ve learned when you trained to be a paralegal. Where are all the late nights, working on exciting cases of intrigue and espionage? Be patient. They may come along eventually. It can be frustrating when those kinds of cases don’t materialize right away, but the administrative requirements of the job are far from the only thing you’ll be doing each day. Answering phones, scheduling, filing, paperwork, and answering correspondence are all just part of the job, but there are more interesting things to do, too. In between all that administrative stuff is the real “meat” of the job – the actual legal work that will have you delving into cases, talking to people, and researching what happened in the past. If your writing skills aren’t the best, you’re going to have a hard time as a paralegal, because you’ll be doing a lot of legal writing. You’ll be asked to draft legal documents, and then you’ll be asked to make changes after the attorney looks them over. Expect to make more than one round of changes on some of them, as well. Want to set yourself apart? Learn how to create legal documents the right way, the first time. Doing that means you’ll get noticed for all the right reasons, and that’s important. It’s both easy and hard to create legal documents. Many of them contain a lot of “boilerplate,” which is all that fine print (or “legalese”) that you see in contracts and all types of other legal documents. That information isn’t exclusive to that particular case, and it’s not going to change. However, a lot of the other information around it will be different, depending on the particular case you’re working on. By using the boilerplate effectively and taking care with the information you have to put in manually, you’ll have a better chance of getting your legal documents right on the first try. Do You Like Playing Detective? A big part of working as a paralegal is doing some detective work. While you aren’t going to get to skulk around, solving mysteries like Sherlock Holmes, you can find some pretty interesting things if you know where to look. Finding witnesses, looking through public records, and doing a lot of investigative work are all big parts of being a paralegal. That’s good news for anyone who’s very interested in learning about other people, and also a good choice for people who like to dig for knowledge. There are limits to the information you’ll have access to, of course, since you’re not a police officer, don’t have a warrant, and don’t work for the government. Still, tracking down a witness to get further information, digging through public records to find property someone owns, or looking through old newspaper information to spot a past transgression that could affect the current case can all seem pretty exciting – especially if you’ve been answering phones and filing paperwork all morning! There are plenty of detective options for you as a paralegal, so don’t be shy about digging into information to locate what’s needed. If you’ve become a paralegal with the idea that you’re not going to be stuck in the back room, looking through old legal books, you might have gotten into the wrong profession. While it’s true that a lot of what you’ll be doing can probably be handled over the internet, there will still be times when you’ll need to spend some quality time with big legal books filled with statutes and case law. There will also be documents to look through, background checks to run, and other methods of determining how to proceed with a case. While it’s ultimately up to the attorney to decide the case’s direction, what you tell that attorney based on your legal research findings can have a big impact on how things play out over time. If you’re not sure about a particular “fact,” make certain you check into it before you provide it. You don’t want to give the wrong information to the attorney, as that could lead to problems for both the attorney and the client when it comes to the value of the case. Legal research is one of the top tasks you’ll be involved in, so it’s time to get comfortable with it and consider this a key issue in the paralegal job description realm. Interviews are part of detective work, and they’re part of the investigative work you’ll be doing as a paralegal. If you’re not comfortable talking to people and asking questions, it’s time to get comfortable, because that part of the job isn’t going to go away. Especially if you want to stand out as a paralegal, your interviewing skills have to be good. The more information you’re able to get from witnesses and clients, the more you can put in your report to the attorney. With the right interviewing technique, you could uncover something crucial to the case. That would be exciting, and could lead to a big breakthrough that will make all the difference to the client and the attorney. Don’t underestimate how much value you can bring to the table by collecting the facts from clients and witnesses. Ask the right questions, and be prepared to ask follow-up questions. It’s a good idea to have them all written down, so you don’t forget anything. You don’t want to keep calling a client or a witness back because you forgot to ask them something. Avoid Columbo’s “just one more thing…” and ask all your questions the first time. You thought the attorney was going to be responsible for the case preparation, didn’t you? Well, surprise! That’s your job, too. While the attorney definitely has the last word on how the case should be handled, most of the prep work of that case is going to be handled by the paralegal. Attorneys work on a number of different cases at once, and one of the things that allows them to keep up that pace is to have good paralegals that are relied on to handle the case prep and other concerns that come up throughout the process. Legal arguments, opening statements, and everything in between is going to fall squarely on your shoulders, and will often eat up a big chunk of your day. Don’t forget the closing statements and the court motions, while you’re working on that particular case. It’s easier to do as much of it as you can at one time, while it’s still fresh in your mind. You’ll have to fit other activities in during the day, but a lot of your time will be devoted to making sure the attorney’s case is ready when the attorney is, so the process doesn’t get delayed. Why are paralegals so valuable? Because they do just about everything! There are a few things they can’t do, of course, or they would be equal to lawyers in their legal capabilities, but almost all of the behind-the-scenes work in a law office is handled by paralegals. They are the glue that holds the legal world – and each individual law office – together. If you decide to be one, you can expect some down times where things aren’t very exciting, and some “wild ride” times where you wonder if it will ever slow down again. That’s part of the reason people choose to become paralegals. There’s always something different, and if you wait a few minutes, you’ll be asked to do something different than what you’re working on at that moment. In the morning you might interview some witnesses and file some paperwork, while your afternoon could consist of legal research and the preparation of documents. Then you get a phone call that changes everything, and suddenly you’re putting your documents aside to do something unexpected. While not everyone likes that level of uncertainty, it can definitely keep things from getting boring or mundane for a paralegal. A paralegal isn’t a lawyer. Some of them may feel like lawyers, with as much legal work as they do, but they can’t go to court, try cases, or actually advise clients. If you’re a paralegal and you’re caught dispensing legal advice, you could get into a lot of trouble. Even if you think the attorney is wrong, or the client asks what you think about something, keep it to yourself. That’s not always easy, but it’s important. That doesn’t mean you can’t make a suggestion or ask the attorney a question about the case, but you want to be sure you’re presenting facts and doing what’s asked of you. It can take around seven years of schooling to become a lawyer, but you’ll need considerably less than that to be a paralegal. In some cases you can get on-the-job training, and don’t need formal education at all. Most paralegals, though, either get a certificate or a two-year degree. Depending on the level of education you get, you may find that you paid pretty well even when you’re just starting out. No matter how much education you have, though, you’ll be doing the grunt work for the attorney, so they can take on more cases. In that way, you’ll be helping a lot of people with your day-to-day activities. A day in the life of a paralegal may not always seem glamorous, but it’s definitely valuable and can improve lives. People who are involved in court cases are generally already stressed and upset, so handling their worries and the facts of their case efficiently is among the best ways to help them mitigate that stress. While you can’t “fix it” for them, you can use your knowledge and skills to make sure the attorney working for them has the right information – and that’s worth more than you might realize. All in all, it makes for a pretty good day.